"Separation of Church and State." Anon: "Satan wants you to use your God-given mind because Christianity falls apart if you do so." From a posting to an Amazon.com forum. "Next crusade: Intelligent Demonic Possession vs. 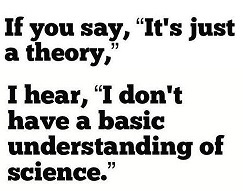 The Germ Theory." "A mystic is someone who wants to understand the universe, but is too lazy to study physics." "Ignorance on your part about natural processes does not imply intervention on God's part." Sir William Bragg: "Religion and science are opposed . . . but only in the same sense as that in which my thumb and forefinger are opposed - and between the two, one can grasp everything." "Freedom of thought is best promoted by the gradual illumination of men's minds which follows from the advance of science." "Ignorance more frequently begets confidence than does knowledge. It is those who know little, and not those who know much, who so positively assert that this or that problem will never be solved by science." Richard Dawkins: "I am against religion because it teaches us to be satisfied with not understanding the world." Albert Einstein: "One thing I have learned in a long life: that all our science measured against reality is primitive and childlike and yet it is the most precious thing we have." Dalai Lama: "When there is a conflict between science and religion, religion should change it's opinion." John Stuart Mill: "To say that secular means irreligious implies that all the arts and sciences are irreligious, and is very like saying that all professions except that of the law are illegal." Bill Moyers: "The delusional is no longer marginal. It has come in from the fringe, to sit at the seat of power in the Oval Office and in Congress." An apparent reference to President George W Bush's rejection of climate change. Moyers said it while accepting the Global Environmental Citizen Award. Pope John Paul II: "Let science tell us what and how. Let religion tell us who and why." Carl Sagan: "A religion that stressed the magnificence of the universe as revealed by modern science, might be able to draw forth reserves of reverence and awe hardly tapped by traditional faiths. Sooner or later, such a religion will emerge." George Santayana: "Science is nothing but developed perception and interpreted intent -- common sense rounded out and minutely articulated." Neil DeGrasse Tyson: "Revelation replaced investigation." He was discussing the downfall of science and mathematics within Islam. Ahmad Mahmud Soliman: "Religion and science are like a two-branched river. They have the same source and flow into the same sea." E.O. Wilson: "I believe that traditional religious belief and scientific knowledge depict the universe in radically different ways. At the bedrock they are incompatible and mutually exclusive." C.K. Chesterton: "A coziness between church and state is good for the state and bad for the church." Charles Henderson: "The founders got it right. Religious passions are important; they are powerful; they are potentially dangerous." John Jay, 1st Chief Justice of the U.S. Supreme Court: "Providence has given to our people the choice of their rulers, and it is the duty...of our Christian nation to select and prefer Christians for their rulers." "...our civil rights have no dependence on our religious opinions, any more than our opinions in physics or geometry." James Madison: "Religion and government will both exist in greater purity, the less they are mixed together." George Washington: "While just government protects all in their religious rights, true religion affords to government its surest support." Attributed to George Washington: "It is impossible to rightly govern...without God and the Bible." This also appears to be a forgery. The image was posted on this web site's page during 2016-JAN.
Howard Garcia, "Laugh or Cry." A book review of Matt Young, "No sense of obligation: Science and religion in an impersonal universe," Skeptical Inquirer, 2002-MAR/APR, Page 51 & 52.